THE STORY - Dr. Steven Murphy is a renowned cardiovascular surgeon who presides over a spotless household with his wife and two children. Lurking at the margins of his idyllic suburban existence is Martin, a fatherless teen who insinuates himself into the doctor's life in gradually unsettling ways. Soon, the full scope of Martin's intent becomes menacingly clear when he confronts Steven with a long-forgotten transgression that will shatter his domestic bliss forever. THE GOOD - Lanthimos sets out to make his audience as uncomfortable as possible and succeeds in doing so. Well shot. A dark metaphor that will shake your soul. THE BAD - Could have afforded to shave off at least 10 minutes. Will definitely be too dark and obscure for some. ​Wide angles, Steadicams, odd angled close-ups, open heart surgery, masturbation, dark humor, arm biting, finger sucking, menstruation, classical crescendos, fully naked Colin Farrell and Nicole Kidman, eye bleeding, zoom-ins, metaphors, Ellie Goulding and not a single deer to be found. I simultaneously want to spend time inside Yorgos Lanthimos’ head and don’t. Not since David Cronenberg or David Lynch has a director come along that has carved out a style for himself, stretching the limits of stories that can be told and how much his audience can endure as Lanthimos has. After his breakout films “Dogtooth” (Nominated for an Academy Award for Best Foreign Language Film) and “The Lobster” (Nominated for an Academy Award for Best Original Screenplay along with co-writer Efthymis Filippou), he is now back with “The Killing Of A Sacred Deer.” For those who thought “The Lobster” was more accessible due to its idiosyncratic dialogue and premise, “The Killing Of A Sacred Deer” skews more towards his work on “Dogtooth” and the results will undoubtedly shock, confuse and disgust many. Steven (Colin Farrell) is a successful heart surgeon who’s previous drinking problem led to the untimely death of a man. Steven feels a great bit of grief and feels he owes a debt to the man’s son, Martin (Barry Keoghan). The two spend time together, invite each other to the other’s homes and introduces each other to the other’s families. However, when Martin’s widowed mother (Alicia Silverstone) makes unwanted advances on Steven, he pulls back. Sensing now that Martin is obsessed with having Steven in his life, Steven begins to pull back from Martin permanently until one day Martin delivers a chilling proclamation to Steven. He must choose to kill either his son (Sunny Suljic), his daughter (Raffey Cassidy) or his wife (Nicole Kidman), otherwise, all three of them will become paralyzed in the legs, lose their appetite, bleeding from the eyes and then eventually die. Being a man of science, Steven desperately uses all of his resources to find a cure for his family as Martin’s proclamation slowly starts to become true. “The Killing Of A Sacred Deer” is the kind of film that nightmares are made from and it’s also not a stretch to think that the film was born of nightmares itself. Steven is in a horrible situation that feels like he, and by extension, the audience, are stuck in a nightmare that they all cannot get up from. Lanthimos utilizes many techniques to put his audience in a state of uncomfortableness. From the opening shot of a beating heart during surgery set against classical opera music to the rising crescendos of the other borrowed music, the oddly angled close-ups, and dialogue delivered as chillingly as you would expect, Lanthimos is determined to transport us to a nightmare, not a dream. Within this nightmare, there is both a personal story dealing with a man put into unimaginable circumstances and a larger story that functions of a metaphor between a surgeon who plays god and a young man who plays the devil. Influenced by the biblical story of Abraham and his son Isaac, “The Killing Of A Sacred Deer” is a Greek tragedy that teaches us about middle-class preservation, the value of human life and our warped perception of justice. It’s a challenging film that is not meant to entertain, despite a few moments of unbearably dark humor. Even the most mundane and normal of situations feels like it is something we are not meant to be watching as Lanthimos’ camera glides, zooms and observes these human beings caught in a personal vendetta between Steven and Martin. 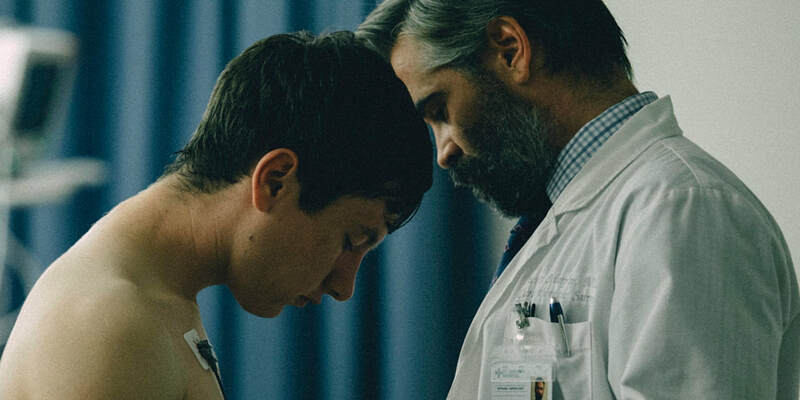 “The Killing Of A Sacred Deer” is bizarre and as dark as they come but its metaphor reveals very deep truths and fears about the human psyche. Yorgos Lanthimos continues to surprise audiences by telling unique stories which push the boundaries of what we can stand in cinema. There is nothing in “The Killing Of A Sacred Deer” that is overtly gory or disgusting. It’s also not malicious in its sadistic approach to the torment that befalls Steven and his family. Lanthimos’ true goal is to unsettle. The whole cast is up to the task of delivering the writer/director’s wish but it's Barry Keoghan who stands out the most with a soulless and disturbing performance as Martin. After seeing him earlier this year in “Dunkirk,” I think it is fair to say that this kid is going places. Colin Farrell and Nicole Kidman are both serviceable and don’t do anything out of character or too over the top to diminish their performances or the overall tone of the film. The real star here is Lanthimos as he creates something that will subconsciously stay with his audience, at least those patient enough to not walk out, for a long time after the final credits roll.